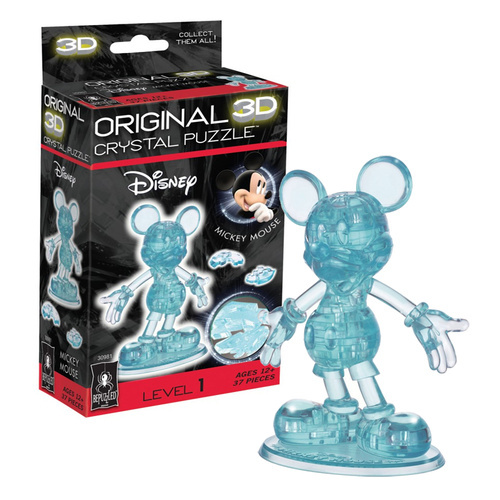 3D Mickey Mouse Crystal Puzzle | Complete with translucent display stand! A unique take on an iconic Disney character! Collect your favourite characters today! Build a cute 3D figure of Disney's Mickey Mouse with this challenging 3D Crystal Puzzle Kit! Assemble the 37 interlocking pieces and you'll be rewarded with a 3D Mickey approximately 7.6cm tall. When completed, the translucent Mickey Mouse is displayed on a flat stand for your collection. Follow the step-by-step instructions and lay out the pieces in order of assembly for the easiest solution! 10 minutes is all I thought this should take.....2 hours later I finished it. Great way to fill in an afternoon.